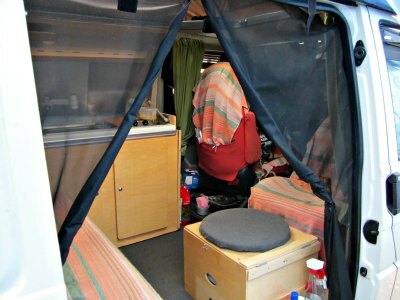 Homemade van campers are your pride and joy. Well at least they should be. 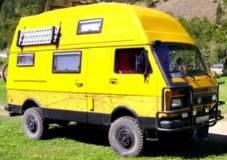 Once you build your own camper van, you'll know how to respect the endless hours, weeks and months of labor you've put into this project. This can be painstaking work where a wrench flying across the garage is a common reaction (at least mine was) when things get out of hand. We all need to balance our temper with something, don't we? But no matter how many "damn it" moments you get, it's a work of art. Something you create with the help of your mind, body and soul. It's a creation of your own two hands and you get to do it all by yourself. Something very important in this confection world that we live in. It's called creativity. 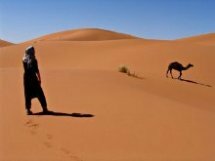 It doesn't have to be the state of art and technology. 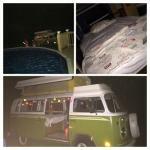 After all, it's only a box of metal on wheels with some plywood and basic camper accessories on the inside. So do with it, whatever makes you feel comfortable. 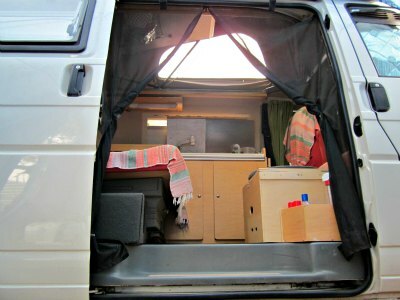 I had quite a few requests to show my finished Volkswagen camper van project in pictures on my website. So here it goes in a few images and words. 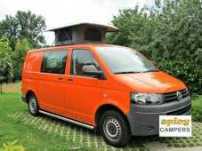 Please keep in mind that I bought many components at Reimo, a German VW van campers part candy store with a long tradition and with a lot of dealers around the world. You can find them on their website. 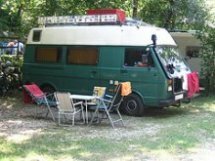 And you're kindly invited to show off your homemade camper vans at the bottom of this page. I'll start with the final cleaning before mounting the rear bench on the sliding tracks. The gray box on the bottom left side is a 50l fresh water tank that I got from Reimo. On the right image taken from the side door of the van, you can see the open closets, the top drawer and a bit of my face. It all ads up to larger storage room. The vinyl floor is simply a color of my choice. The kitchen unit. The lid on the left is from the Waeco refrigerator,and the Smev sink with a double burner stove on the left. 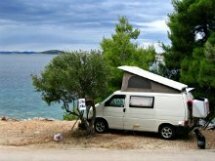 The plywood covers where added later on as I was in a rush for the first trip with my camper van to Greece. Camper windows on either side are from Seitz. They're not cheap but fit perfectly in the panels. Insect mesh and sun screen are already built in. Vents above the fresh water tank serve for the air circulation of the auxiliary battery housed under the wardrobe compartment. 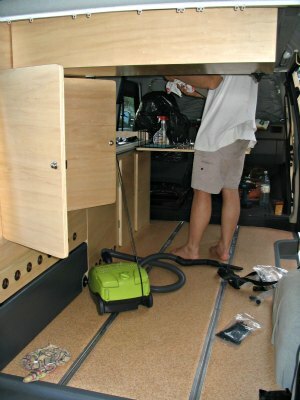 Vents on the bottom serve to keep the camper refrigerator compressor cool enough. Van campers need propane to cook your food at least, so the left door of the cupboard is housing the propane bottle, and I use the other side for camping food and other cooking supplies. The Reimo rock & roll rear seat comes in and I used a orange microfiber upholstery to cover it. Not a wise decision if you have a couple of kids and a dog. But I resolved the issue the easy way later on. 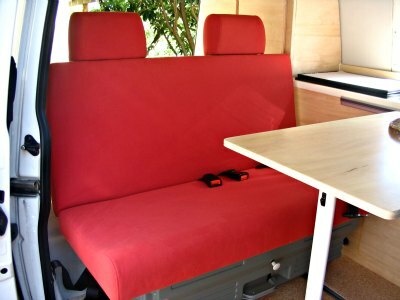 Note that these bench seats have quite a large storage room below the seat and you can slide them throughout the length of your van. 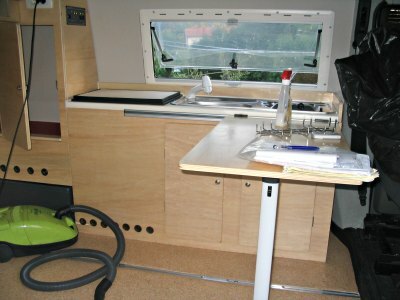 The same sliding bench made for Volkswagen T4 van campers from the back of my van. The panel on the right is covered with velour material and I added a couple of nets for books and other stuff you might need them for. Don't forget the wooden batons on the inner side of the quite thin plywood panel to secure the nets or anything else you might want to screw in there. It just wont hold it. Wood is my kind of material. I kind of like the warm and cozy feeling it radiates. All the wooden components are made from lightweight and waterproof poplar plywood of different sizes (thickness). Poplar plywood is kind of soft, so I used three hands of water based varnish to protect it. Over the years the wood has a few minor dents and bruises, but who cares anyway. The white kitchen counter-top is a regular kitchen component. just cut it to fit the size for van campers. You can actually use anything you want, just get the varnish protection right. All the pop top windows give lots of light an fresh air and a wonderful chance to gaze at the stars before you drift to sleep at night. Another shot of the lightweight poplar wood interior. The box you see on the bottom right covers the portable toilet. 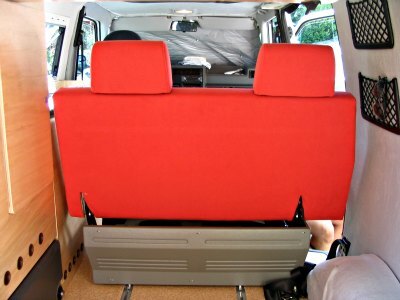 With the addition of some padding on the top it doubles up as a seat or a place to relax your legs. I covered them with hand made cotton rugs or blankets that I picked up on the island of Crete on one of my travels to Greece. While the large one perfectly overlaps the rear seat, I had just cut the other one of the same size in two pieces. There was a bit of sewing to be done, but it looks great now. They're easy to wash and feel great to the skin. As you may have noticed, there is a insect mesh on the sliding door opening. Believe me, when they start to get nasty...just zip it down and they're gone! Well most of them. The outside of the van was left as it was. The paint job was in excellent conditions so that was something I chose not to bother with. I could have gone with a fancy paint job, but I'm not really into that anyway. Building home made campers it's obviously something we don't do every day. But the pride and joy you put in your creation is purely something else. Being creative in a natural state of mind is making your life worth while. Making a living out of it is even better. But the first is far more important. 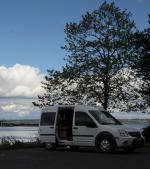 Our van campers are our pride and joy, aren't they? 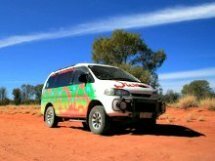 If you have your own homemade camper van and would like to share it with us, this is the place to be. Share your thoughts and experiences or a couple of tips and ideas of your own. 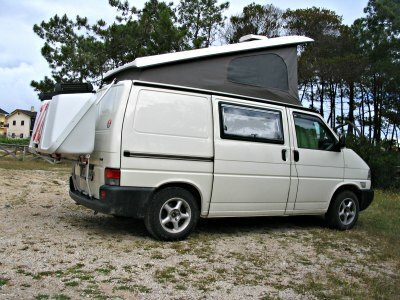 No two homemade camper vans are the same and I'll bet yours just might be full of helpfull tips. 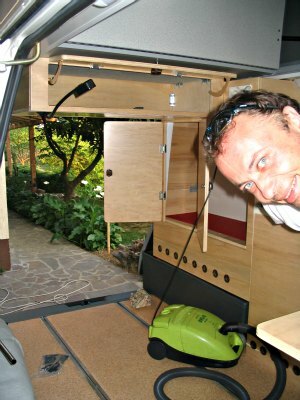 Enter the title of your homemade camper van story.